The woman who got adults coloring again. – Because in this game of life the more you know the better player you will be. The woman who got adults coloring again. 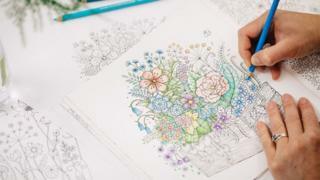 The woman who pioneered the adult coloring book trend says a lack of funds and a battle with technology created her multi-million-selling trademark style. 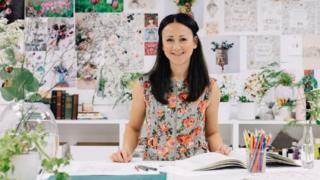 As a hard-up art student, Johanna Basford couldn’t afford all the different colored inks everyone else was using. And at Duncan of Jordanstone College of Art and Design in Dundee, her aversion to technology pushed her into choosing silkscreen printing as her craft. She says: “I ended up specializing in silkscreen, mainly because I couldn’t afford a computer and our textile department had just bought this really fancy digital printer, and I couldn’t work it. “So screen printing – analogue – this was my thing. Nobody else cared about it. “I was also really skint and black and white – single color – is the most cost-effective way to screen print. Johanna, 35, from Ellon, Aberdeenshire, always knew she would be an artist. She was not quite sure which discipline would claim her but she knew she loved to draw. 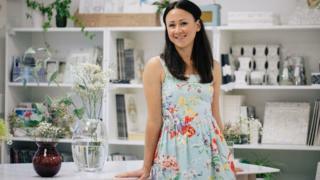 At art school, she chose textiles because they were taught in bright top-floor studios with fantastic views of Tayside. She had considered interior design and graphic design but the studio for that was in the basement of the college and she was determined not to spend three years underground. “That was how it all started – because I didn’t like the basement and I couldn’t afford color,” Johanna says. Like many of the best success stories, Johanna’s was a bit of an accident. She says: “What happened was, my single color collection really caught the eye of a lot of people when I graduated. “Because I did something different they really stood out. After graduation, Johanna worked as a freelance illustrator. Her black and white creations became sought-after and she created artwork for commercial giants including Starbucks, Absolut Vodka, Nike and the Smart car company. The adult coloring trend was not even a line on the page when she was approached to try a coloring book. She told the BBC: “A commissioning editor called me up and asked if I want to do a coloring book. “I said I’d love to but I wanted to do one for adults. You can imagine how quiet they went. This was the end of 2011. They weren’t sure at all. “I launched into a pitch, saying it’s going to be really sophisticated and beautiful and creative. Johanna says it was a big risk doing the coloring book. It was a passion project and she was warned against it. She says she didn’t have time to do it and was working 12-14 hour days on her commissions. But with a bit of perseverance Johanna’s first book, Secret Garden, was published in 2013. Its success led to six more and she has now sold more than 21 million copies in more than 40 countries. She was awarded an OBE in the 2016 Birthday Honours list for services to art and entrepreneurship. Johanna remembers the surprise success of Secret Garden. She says: “My first baby was six months old and things were hectic. I remember the publisher trying to reach me and I said she should just let me know when it reached 500,000 copies. Johanna had no idea the coloring trend would take off. She thought her mum was going to have to buy a lot of copies of the book to help her save face. “If I had set out to invent a book that would sell 21 million copies I wouldn’t have been able to,” she says. Her seventh and latest book is World of Flowers which was inspired by the woman she took her talent from, her grandmother Joan. “She was a gardener and an artist,” said Johanna. 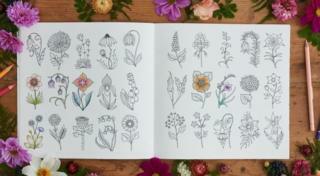 “She had these botanical books and when she found a flower she would go in and color the flower in her book. Since her first book, the popularity of adult coloring books has skyrocketed. But Johanna is happy to see other illustrators join the trend. “I’m super proud,” she says. “To see all those other books start to come out and take that space and get people excited, that’s amazing. 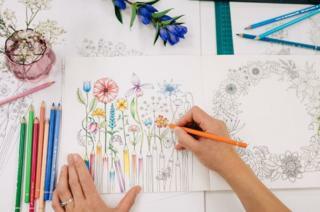 “More and more people are putting down their devices and picking up a pen and pencil and getting creative.